The Beatles 50 Years Ago Today: May 26, 1967. Beatles Radio: The Beatles, Solos, Covers, Birthdays, News The Fab 4 and More! The Beatles masterpiece, “Sgt. 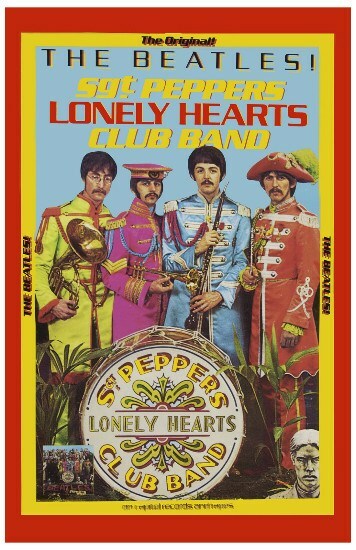 Pepper’s Lonely Hearts Club Band” was released in the UK, one week before its American debut. The album took over 700 hours to record under the direction of George Martin and cost $75,000 to produce. A then state-of-the-art four track recorder was used to build each song layer by layer. The LP spent 22 weeks at the top of the UK albums chart and 15 weeks at number one in the US. The iconic album cover, depicting the band posing in front of a collage of celebrities and historical figures, was designed by English pop artists Peter Blake and Jann Haworth based on a sketch by Paul McCartney.